We’re excited to announce this year’s spring and summer calendar of public programs at Freshkills Park! These free tours and events offer unique opportunities to visit and learn about the landfill-to-park project. 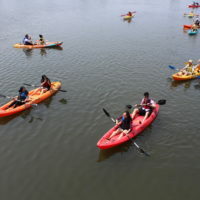 Whether kayaking through the creeks or hiking and bicycling along miles of meadows, you’ll experience large sections of the park before they open.